For the record, I like beans. Let me rephrase that: I like most beans. Lima beans, however, are one of the few varieties I can’t stand. Not only do I not like them, but I absolutely do not respect them. So when I learned that April 20 was National Lima Bean Respect Day, I thought, no way is that happening. Especially since it’s also National Pineapple Upside Down Cake Day. P.U.D. Cake is something I most certainly do respect. But then, the more I thought about it, I started to realize that the whole point of this food blog is to embrace the challenges and try new things. It would be easy to celebrate P.U.D. Cake, but there’s nothing adventurous in that. I thought it would be fun instead to celebrate a food both Tara and I despise. It took some convincing for her to agree, but in the end she was on board. Lima beans, also known as butter beans, were first cultivated in Peru around 6000 B.C. They were discovered by European explorers in the capital city of Lima, which they were named after. They were discovered to have a long shelf life – rivaling even Twinkies! – and became a popular food item for ships setting out on long ocean voyages. They arrived on America’s shores sometime in the 19th century. Lima beans have excellent health benefits: they are high in fiber, which lowers cholesterol and prevents blood sugar levels from rising too quickly following a meal, making them an excellent protein source for diabetics; and contain a variety of vitamins and minerals, including iron, manganese, and molybdenum. Beans, beans, good for the heart? In this case, very true. Too bad they taste like crap. Oops. That wasn’t very charitable of me. I’m not helping the cause at all, am I? We bought a bag of frozen vegetables advertised as an “Italian mix.” It contained carrots, cauliflower, green beans, and lima beans. We picked those out and ate them separately. I found them very starchy, and Tara said they had little flavor. However, we both agreed that they weren’t as bad as we’d thought. “Not as bad as we’d thought.” Does that count as newfound respect? We weren’t happy that we had to eat lima beans. 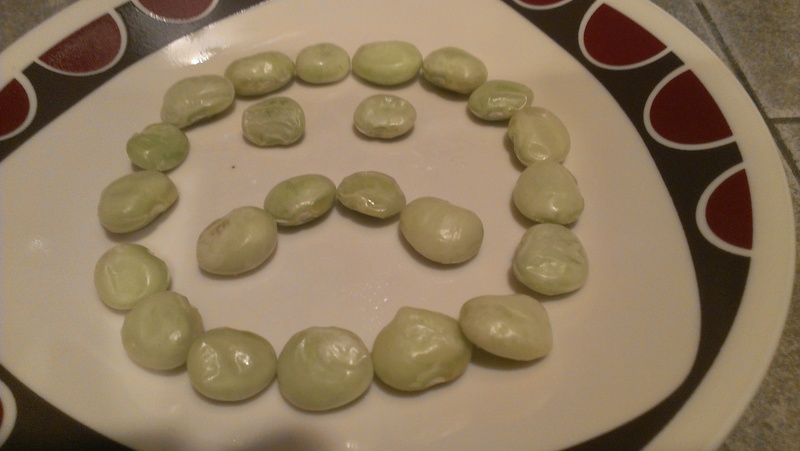 Frozen lima beans by themselves are not that great. I like them better when I cook dried ones. One of my favorite ways to eat lima beans is mixed (along with other veggies) into macaroni and cheese! I can see how they’d be good mixed in with mac ‘n cheese! Lots of flavor masking going on there. Which is a good thing. The face says it all! Like I said earlier….I despise Lima beans…but like them in Ham and Beans…but they have to be the big white ones and they have to soak for like a week. I made ham and beans once, but I think I used Great Northern beans instead. Not sure how it would be with lima beans, but I’d try it. I LOVE LIMA BEANS!!! I would have eaten them for you!!!LOL. NOW you tell me, Wendy. Next time we have to make something we don’t like, I’ll call you, okay? I love lima beans-my mom made them in a tomato sauce-they were delicious! They sound like they’d be pretty good that way, actually. And then there is succotash. We actually talked about trying it that way at one point! Thanks, John. How many things did you try that you didn’t like? Um nothing really strikes me at the moment? There were definitely a few disappointing recipes… but also a lot of new meals I never knew about that I still make on the regular! …I always thought I hated tripe, but even that came out good at the end of the year! Oh, no. There’s a tripe day?! I *have* had that before, and was definitely not impressed.